Flagpole F1- F6= $61.00 These sites have excellent southwest satellite reception. 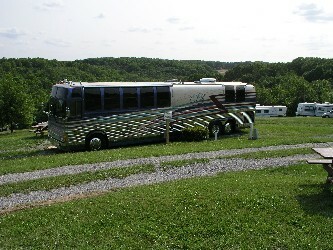 They are ideal for large RV's, motor homes and 5th wheels. They over look an incredible view of Little Falls Valley high a top the piedmont plateau in northern Baltimore County. Panoramic P1- P6= $61.00 These sites also have super satellite reception, a beautiful view, and are located just below the Flagpole sites. 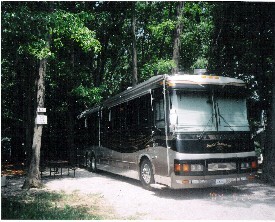 They are also suitable for large RV's, motor homes, and 5th wheels. Valley View V1- V2 = $61.00 These sites are similar to Flagpole and Panoramic and offer excellent reception as well. 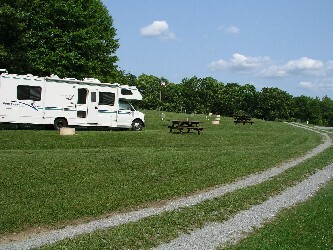 Many campers find these sites more desirable because they are even larger. A 10= $62.00 This beautiful shaded site has excellent satellite reception that is located just off the ballfield in the woods. It is a back in with 50 amp Electric Service, Water, Sewer, Cable TV and Free WiFi connections.